The “Caliber” folding unit uses a very inexpensive FDA approved flexible poly liner bag inside of a heavy duty, stackable, folding, plastic IBC. This combination of features gives you a 315 gallon capacity reusable container, with all of the advantages of a machine handleable semi-bulk shipper with or without a bottom drain, for a cost that is less than the cost of 55 gal. drums. . . Disposable, flexible poly liners are made in clean room conditions. Inexpensive liners are discarded and replaced after each use so there is no need to clean the container. 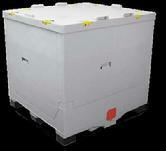 Empty IBC folds down for reshipment back to source at attractive freight rates. Empty IBC folds down for storage at a ratio of 2.5 empties to 1 full unit. Reusable IBC portion can be rented or leased.